Celebrating the graduate is always fun. CelebrateAHero I love your service. What a great success the book we did for my son was. Rob graduated High School this year and I wanted to give him something that had real meaning. Your book allowed me to catalog his high school years through pictures and words. Family from all over the country contributed their congratulations and best wishes. Rob’s grandparents were not able to make it to the party. However, I was able to email them a copy of the book so they had a chance to see it. I am planning to make them an anniversary gift book next year. I got a book for my graduation from college last year. I was so touched. So many people took the time to write to me and let me know why they cared about me. I loved my book so much that I decided to do one for my niece who is graduating from High School this year. I can’t wait to give it to her. Thank you CelebrateAHero.com. This is a book that I will keep for the rest of my life. Designed a book for my niece in Florida. She is a very special person, as she always goes out of her way to help others. Sara is so thoughtful and caring, making *her* book was a way for me to tell her just how special her family/extended family & friends feel about her. It was fun to collect all the comments from around the country. I was not there to see her face when it arrived, but I was told she had tears well up in her eyes. Sara tells me it is something she cherishes. And I in turn think she has an inkling of her uniqueness thanks for the wonderful opportunity to create a book! 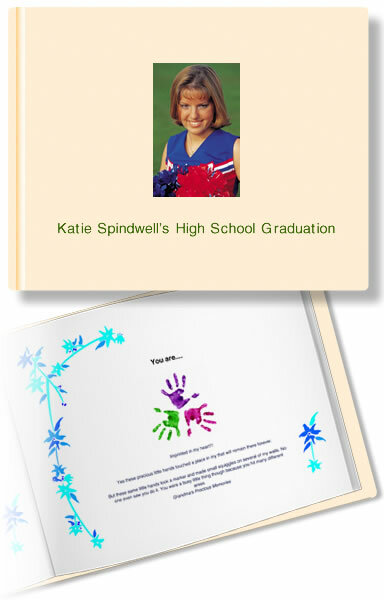 I did this book for my daughter’s college graduation. I included old friends, present friends, family members, past teachers and principals, and former pastors. We had a great response, which ultimately gave us a wonderful book of memories. We presented her book to her at a graduation party in her honor.